When autumn riptides break free and sculpt a deranged shoreline out of the beaches of East Hampton, I often recall one of my last conversations with Little Edie Beale. I imagine seeing her again, the prisoner of Grey Gardens, freed by the postseason to appear in her black net bathing suit, perhaps perform an antic little dance, then streak down from the dunes trailing a long silk scarf and plunge into the embrace of waves. I loved her spirit. We ducked under the ropes of bittersweet hanging from a pair of twisted catalpa trees and skittered past a 1937 Cadillac brooding in the tangled grasses to find ourselves at the tippy porch steps of Grey Gardens. A hand-lettered sign hung from the door: Do Not Trespass, Police on the Place. Cats crouched all around in the overgrown grass, rattling in their throats, mean and wild. There was no turning back. We whirled at the sound of the tremulous voice. A middle-aged woman was coming through the catalpa trees, dressed for church but most oddly: a sweater wrapped around her head and her skirt on upside down. Her face was oddly young, as if suspended in time, faintly freckled and innocent, but painted with thick dark lipstick and heavy eyeliner. It struck me that she looked strangely familiar … like … like who? “Are you looking for Mother, too?” she asked, more unnerved than we. My little girl held out the box of bunnies. My little girl said it must be fun to live in a house where you never have to clean up. My daughter asked if there really were police on the place. “Not really, but there are boys who come over at night sometimes and try to club the cats to death.” I suggested the boys might just be prankish. Now it clicked. The woman before me was a version of Jackie Kennedy coming back from church on a Greek island, but this was Little Edie in the summer of her 54th year. “You … resemble your cousin,” I stammered. After her death in 2002, Little Edie left a diary, letters, poetry, and stunning photographs, which were recently shared with me by Eva Beale, the wife of Little Edie’s nephew, Bouvier Beale Jr., the executor of her estate. Eva Beale is at work on a coffee-table book about the family story that will include much of this material. The first act of Doug Wright’s musical casts Little Edie as the dreamy “It” girl of East Hampton in 1941, preparing for her fictional engagement party to Joe Kennedy Jr. It’s a re-creation of Grey Gardens in all its glory, with Mother singing racist show tunes and the butler twirling a silver tray while a knobby-kneed Jackie is entertained by her reactionary grandfather, Major Bouvier. The second act leaps over 30 years to find two dotty divas locked in a devouring bond amid the decay of their estate. What had broken Little Edie’s dream? How did she lose all her hair? How did she wind up such a captive of her mother? Little Edie’s papers fill in the blanks between the two acts; they are their own drama of maternal psychological seduction. The diary, written in 1928–29, when Little Edie was a preadolescent, is the family Rosetta stone. It is meant for an audience, as if preserving her story for future publication when she became famous. The seeds of this tortured tale go back to the Jazz Age, when the Bouvier clan first discovered, beyond “dressy” Southampton, the “simple” summer resort of East Hampton. Major Bouvier, Big Edie’s father, used his first wife’s fortune to buy Lasata, the family estate by the sea where his progeny could jump their horses over topiary hedges. Little Edie, born in 1917 and the eldest of ten grandchildren, was the family beauty, “surpassing even the dark charm of Jacqueline,” according to their cousin John H. Davis, a professor who wrote a book about the Bouviers. Mother kept the child out of school for two years—Little Edie’s 11th and 12th years—and brought her daughter to the theater or movies almost every day. A frustrated singer herself, Mother ensured the girl would be as starstruck as she was. And despite the excuse that Little Edie was “too weak” to return to school, she was perfectly well enough to go on a shopping trip to Paris. Little Edie dated Howard Hughes and likely had proposals from Joe Kennedy Jr. and J. Paul Getty, says Eva Beale, but always she sent her suitors away. In a final act of negation, she tore out the faces of her boyfriends from the photographs she saved, so only her image remained, solitary and sad. She continued to dream of becoming famous for something other than being Jackie’s cousin. But the Gordian knot that had always tied her to her mother appears to have locked for good in Little Edie’s mid-thirties. Scandalized by Big Edie’s theatrics and running out of money, Phelan had divorced her by telegram, from Mexico, ran off with a young thing, and left his ex-wife in the 28-room house a block from the sea. 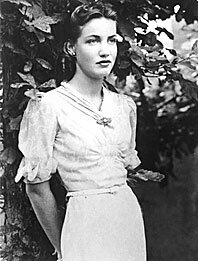 Major Bouvier constantly wrote to his daughter telling her to quit going to the club and to sell Grey Gardens. Mother refused. When she showed up at her son’s wedding dressed like an opera star, Major Bouvier cut her out of his will. Big Edie slumped into depression and blew up with weight. Later, she could no longer afford to send her daughter grocery money in New York, and Little Edie lacked any capacity to support herself. “Did you ever go for the audition?” I asked, desperate for the end of the story. There may have been a final fit of rebellion shortly after Little Edie moved back to Grey Gardens, as later described to me by John Davis. Little Edie’s hair had begun to fall out in her twenties; the family now ascribes it to a stress-borne illness; hence the constant head-coverings. But cousin John told me about a summer afternoon when he watched Little Edie climb a catalpa tree outside Grey Gardens. She took out a lighter. He begged her not to do it. She set her hair ablaze. And in that act of self-immolation, she sealed her fate as a prisoner of the love of her mother. After my story, it was in fact Jacqueline Kennedy Onassis who came to their rescue with a $25,000 check for a cleanup, on the condition the town would let them stay. In 1975, the Maysles brothers persuaded the Beales to vamp for the film that would become a cult classic (hard as it may be to fathom, the house as seen in the documentary was actually tidier than when I’d visited it). The ladies hoped to get money from the deal, says Eva, though they never saw a penny. It did, however, make them famous. When Big Edie died two years later, no one believed that Little Edie could survive their folie à deux by herself. But her optimism was only part delusional. It also helped her to live another quarter-century on her own. She held out against selling Grey Gardens as a teardown, until, in 1979, Sally Quinn and Ben Bradlee promised to restore it and paid $220,000. Little Edie called to tell me she was ready to move back to New York, at last. Her exhilaration made her sound 19 again. A brief splash singing in Manhattan cabarets delighted her, no matter how the critics mocked it. She later moved to Bal Harbour, Florida, and swam every day until close to her death at the age of 84. 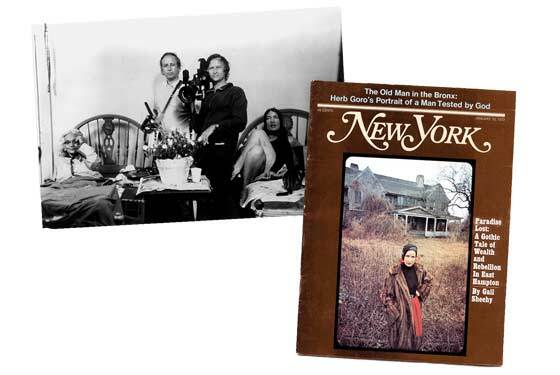 Had the two prisoners of Grey Gardens not been born in a prefeminist era, I believe they could have become stars. Certainly, that’s what Little Edie had in mind when she titled the childhood composition book in which she wrote poetry: Edith Beale, Celebrated Poet, Author and Artist.